Clean & nice decorated room. Full in-room facility. I found nothing bad about this hotel. It is best value. The room is so clean and the decoration is so nice. 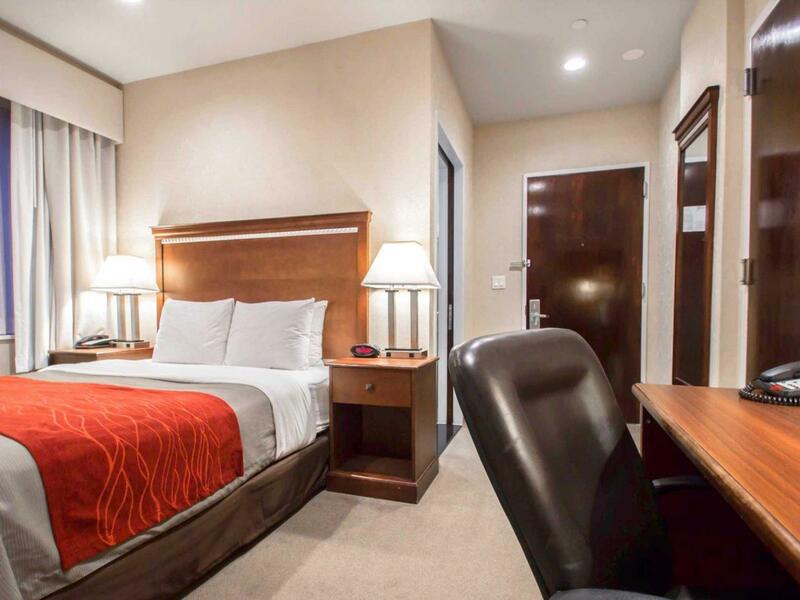 It is located in China town, so if you are Asian, this hotel is most recommended as you will find many good Chinese and Vietnamese restaurants nearby. It's also near the subway station so it is really convenient. Though, the line of breakfast is not much variety but I did not find it a problem. The Wi-Fi is also available. The hotel staff is friendly and helpful. I will definitely stay at this hotel again. The Comfort Inn hotels has been surprisingly good. Beds and bathrooms are clean; the breakfast available includes hot omelette and crispy bacon, waffles with various types of muesli and fresh fruits. Hot and cold water readily available and ice as well. All of these are included in the price. Location - it is near Chinatown with its great no of good and cheap Chinese restaurants; the more expensive Italian in nearby Little Italy. Not too far away (by walking or a USD 10 taxi fare are the Zbrooklyn Bridge and 911 memorial. Katz, the local and famous deli is just a short walk away. My partner and I were staying in a private room booked via air bnb. 4 days in and we realised we were in a nightmare house and looked everywhere to book another hotel to get out. After Doing so for hours we went with comfort inn even though reviews were mixed. We love it. For that price we paid to stay in someone's dungeon so it was a pleasant surprise. Yes the carpet is a bit old and rooms don't smell like 5 star hotels, but be realistic in NYC and for the price that you are paying. And If you are in NYC you should only be back to the hotel to sleep. They offered us free breakfast for the 5 nights we stayed when agoda said no breakfast was included, nice gesture indeed. They could certainly improve on more selection of food but once again it was great ! Would definitely come back. Staff were very helpful and friendly, location was great and good value for money. 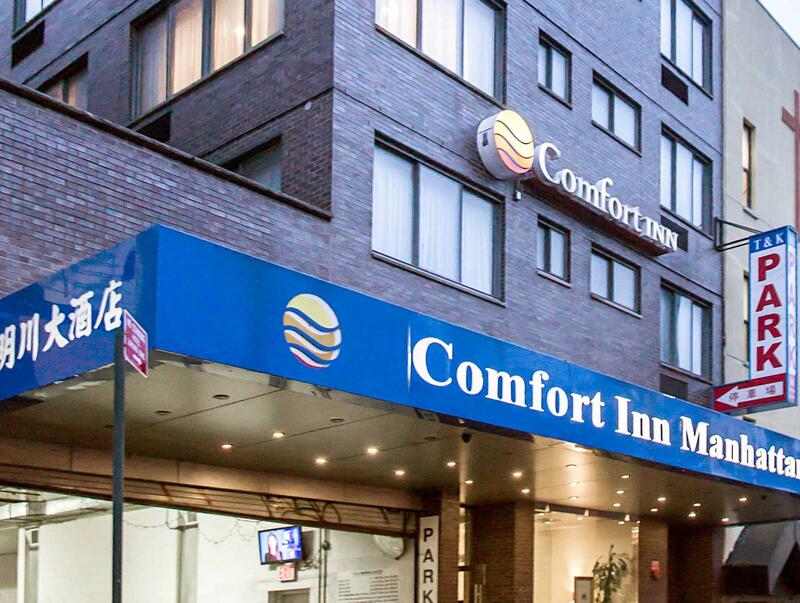 We found that Comfort Inn a great location, first timers in New York so subway was easy to get to (3 mins walk.) Bed was good, room size was fair but thats what we expected for NYC. Free breakfast was ok, no issues there to fill up quickly in the morning. Coffee, eggs bacon etc. Cereals, waffles juices and assorted coffee cakes. Staff were always helpful. We liked the place and would go back again. Had a good stay at this hotel. Just a couple of caveats: the walls are paper thin and I could hear everything going on the room next to me. One guest slept with the TV on all night, so in addition to his snoring, I got to enjoy ESPN until he got up in the morning. Earplugs solved the problem. The bathroom was huge by NYC standards but there was no counter space for a toilet kit or anything else. This is a very residential area. Hard to get a cab from here, so if you need one, be sure to ask the desk clerk to call one for you. Very quiet neighborhood with a park across the street. 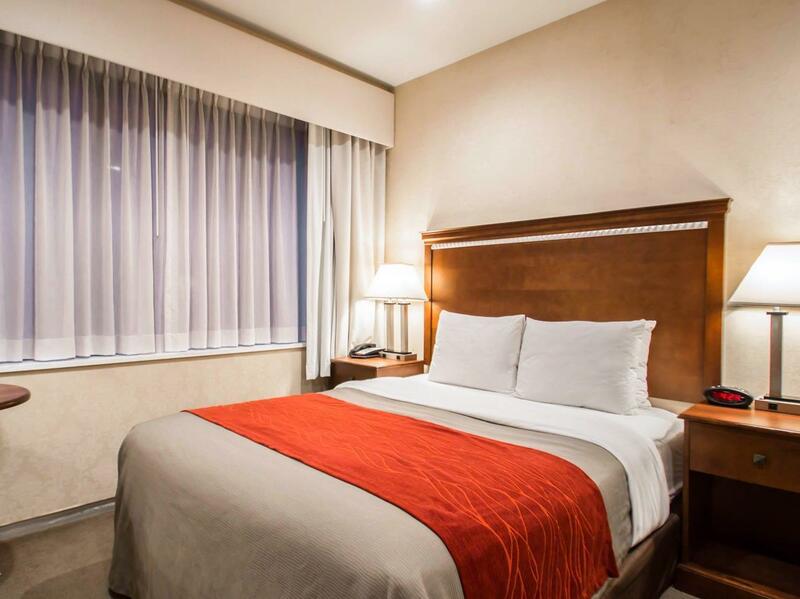 Really a great deal for a stay in New York. quick check in and check out.The bed very comfortable and hotel was well maintance. Some upsides and downsides to the Comfort Inn. It was old, tired and located in Chinatown and stepping out of the door was an interesting experience in itself. However, within two blocks there was a Metro station and within half a dozen blocks the environment changed completely, depending on which direction you walked, of course. North is much nicer. The cost was ridiculously high, but when we saw the prices being asked for other hotels in Manhatten it became - in relative terms - more explicable. The room was 'cosy' to say the least, although the bed was comfortable and the shower was good. Being at the end of a corridor the wi-fi signal was really hit and miss until the concierge sorted it out through the fabulous IT support team. Breakfast was awful, and served in a corridor that had only 10 tables to accommodate the whole hotel. That was far and away the worst bit of the stay. Ultimately, the hotel served the purpose we wanted it to serve - at a price. It was warm, safe and we weren't overly disrupted by the noise. We were also able to walk to every one of the locations we wanted to see in Manhatten. So it would be churlish to grumble too much. We're staying for one night before hopping in for a bus tour just next door. Great location, small room though. But nice staff & good continental breakfast. Huge bathroom! Just need to open the window a bit to clear the air. It's near the subway station. The surrounding is quiet. It's near the bus station. It's good place to stay for vacation. The room rate is not bad. The room is clean & tidy. But there is a little bad smell of carpet in the room. The surrounding is quiet. But It's near subway station. That's great. It's also near the supermarket. So I can find anything for my daily use products & foods. 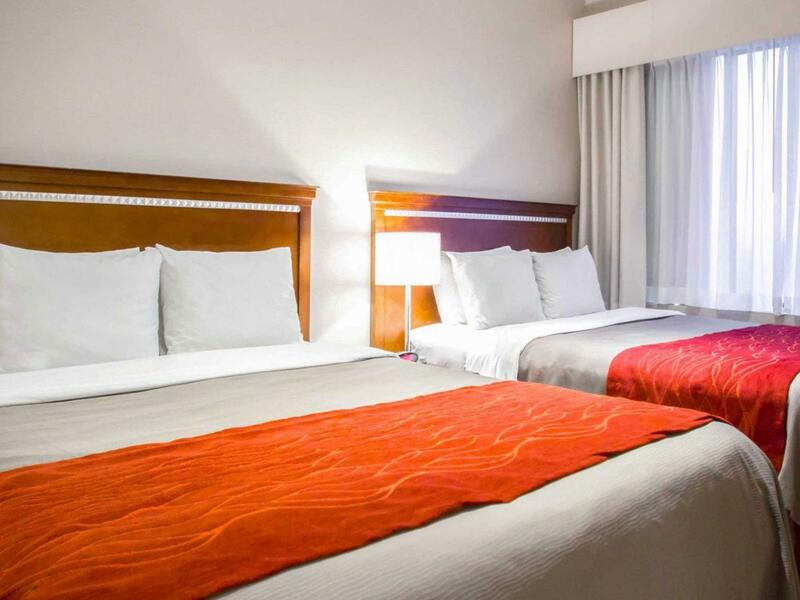 - Fast and fuss-free during check-in & check-out - Spacious and clean room with iron/ ironing board and coffee maker in room - Daily breakfast included though I wish they could have rotate the selections. - Close proximity to subway. - Plenty of eateries in the area with Little Italy nearby. First time in NYC. 3 mins walk to subway grand st which connects you to most tourists attractions within mins. Half hr walk to other parts of tourists attractions like wall str, liberty, 9/11 memorial located at lower manhattan. Overall I felt the room was very clean. The photos posted are pretty much accurate and what you'll expect. No surprises. Wifi was amazing and strong. No blind spots. Worked perfectly well for phone, mini iPad or work laptop. Initially my package didn't include breakfast but upon arrival they were kind enough to include for me so that was a total unexpected bonus. The breakfast was very VERY simple (total no more than 15 choices) so please do not expect any service like you'd normally expect from 4*. I would definitely stay here again if the price is still cheaper by half compared to other hotels in manhattan. The staff at Comfort Inn specially the ones at the front desk are very friendly, helpful, efficient, cheerful and pleasing. We had a very fast check in and check out. The room and toilet are clean. And the hotel has a good location near the subway. The downside is the room is so small and the bed is so high (we had to literally climb up the bed). Overall, we had a good stay in the hotel. This hotel is beyond what I expect of a two star hotel. The room seems really clean. The only issue is the heat being on a bit too high on that day. Will defiantly stay again the next time we visit. Everything is good exception of dirty carpet. Hotel should supply a pair of thongs ,overall it is value for money. Nothing to complaint. Too good. Clean and modern. Surrounded by plenty of restaurants in China Town. Very easily accessible. สถานีรถไฟใต้ดิน Grand Street - ระยะ 0.18 กม.